i started calling her rotten back, and soon added some other grandparent-ish figures into my "rotten kid club". grambie was one of the first. she helped define the parameters for my club, which included just 3 things ... 65 or older, a twinkle in the eye, and a sense of humor. she ended up with her own rotten kid stationary, and embraced her new moniker gladly. rotten to the core. other friends started worming their way into my heart and club ... richard the gruff softie with a heart of gold, mr robert who would loosen his dentures and rattle them around in his mouth during church just to make me laugh, ruth the twinkling bird who never failed to ask me for one of my dimples, and more. by the time i'd collected a good handful of these treasures, and learned to love them hard, i had to say goodbye to the first. jackie lost her battle with cancer, and i mourned the loss of her shine, and the shrinking of my flock. i gradually added more over the years, always having at least 3-4 on the roster. watching some fade, and some go quickly. all of them written in my heart. once we moved to brooklyn, it took me awhile to find a new crowd. first up was charles, our landlord. a more gracious and delightful man would be hard to find. we lived in his home for 9 years, and every year deepened the connection. he was gentle, wise, tough, and kind. patient too. he cared, counseled, forgave, shared. it didn't hurt that he played a grand piano (to "keep his mind sharp") in the studio apartment right below our bedroom, and sometimes sang along. it made me love him all the more. it was hard to leave him when we moved, and a delight to go back and bask in his hospitality at the block party the following summer. i'd hoped to do the same this summer, but he passed away april 10th, suddenly but not shockingly (he'd had a bad heart for many decades). i never called him rotten to his face, somehow that tradition fell away as i got older, but he was most definitely in that corner of my heart. i kicked myself hard for not talking to him for the last several months, even though i thought of it many times. i felt like i never said goodbye, but in reality it would have been just another conversation as i didn't really expect him to go yet. he hated the idea of getting feeble and unable to take care of himself, and said many times he was ready to go whenever God was ready to have him. he got his wish, having just carried his groceries in when he had a heart attack. a mighty man. while at charles' funeral, i ran into another old friend and neighbor, eugene. i've blogged about him before, and miss him immensely. we talk by phone every couple of months, though i've only seen him a few times in the last year and a half. a treasure of a very rare sort, and full of history, cheer, and thankfulness. gallant too. when i asked him how he was doing, he said "not too good" and told me about his upcoming dr's appointment to check his leaky valve. he's 93, still forgets nothing, and lives alone in one of the apartments in the home he's lived in his entire life, managing the rental of the other units. after asking about his health, i brought up his girlfriend of 40+ years (and as rotten as he is), louise. 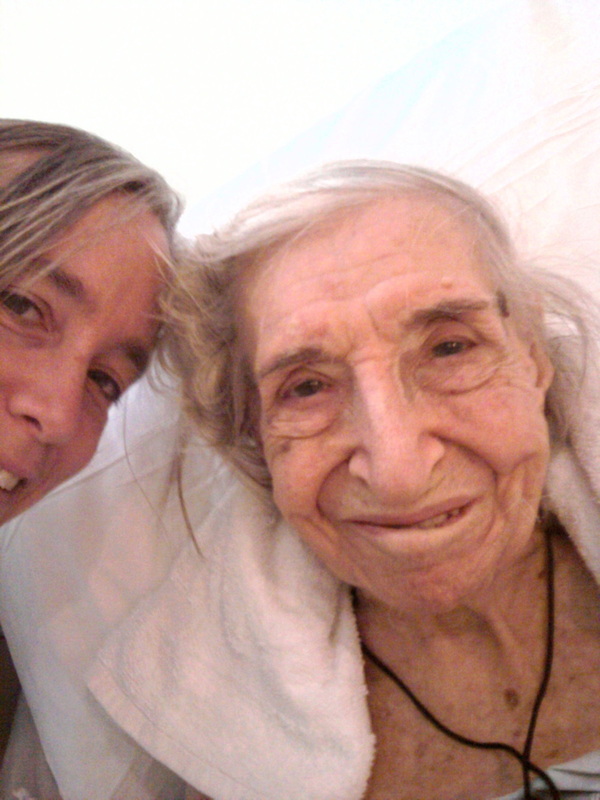 when i last saw her she was in an extended care facility, recovering very slowly from a fall. she's 96 years young, and even sharper than eugene. he informed me that she'd recently gone into the hospital for pneumonia, and while there they'd discovered leukemia. she was already in hospice care. it is truly becoming a rotten spring. i got her details from him (he rattled off her phone number and room number from memory) and went to see her the next morning, having no idea what to expect but knowing i needed to say goodbye. i found her chipper, smiling, and happy, despite admitting that she had been having trouble keeping food down and that morning had found it hard even to swallow. we talked for two hours, of shoes and ships and sealing wax, of cabbages and kings. almost. she asked after the family, discussed politics and education and her life experiences, expressed a few regrets, and offered up random facts in case i needed something to add color to a conversation (origin of mark twain's name ... anyone?). i had a terrible time making myself go, and snuck in a phone pic and a kiss on her forehead (she's in isolation) before i wrenched myself out into the hall. i hate goodbyes. i'm getting weary of them. i'm waiting for the call. another of my tribe is kevin, the man i first met as the crazy coat maker. (anyone who's run across my husband in a shaggy green coat will know what i mean.) he sells his creations at the local artisan's market in brooklyn (just for kicks really, he also sells to Bergdorfs, etc and gets paid crazy money for them), and i always pored over his work when we lived there. michael really wanted one of his coats, and he said he'd make a custom one if we could come up with i think it was $100. it took months to get it together, but in the meantime i stopped by and started chatting with him every chance i got. his stories are endless. he worked for many years at the world bank (and still has a driver to chauffeur him around), sells to cranky celebrities and tolerates little attitude, has inherited famous fur collections which he works into his coats, loves peaches, cares for his disabled adult daughter, and gives constantly. i never tire of listening. he came to summer parties, stopped by with presents, and was tickled pink when i finally found something i could give him ... a copy of HONY's book that features a picture of him and his neighbor in the middle of a snowy Bed Stuy street. He never knew it was used anywhere, but was very pleased. i had been utterly thrilled to find him when flipping through my first copy. i bought another coat from him last december, when he was showing at the bwac show in bklyn. we chatted for a good bit, and i had a friend snap the pic above. another vendor came by, and asked if i was his daughter. he looked at her, over at me with a dry twinkle even though i was already shaking my head, and said "yes". i melted. rotten to the core. again. kevin had a stroke about a month ago, and though a crazy series of connections involving another market vendor and my husband's recognizable mustache (among other things), i got a phone call with the news fairly promptly. he's in a pretty crappy hospital in brooklyn, and initially was bedridden and somewhat brain scrambled, though he recognized visitors and could talk a bit, the words were out of order. michael got in to see him 3 weeks ago, and they had a good visit. i really wanted to see him also, and managed to plan a brief visit on the way to charles' funeral. he ended up back in the ICU just a couple hours before i got there, and was totally tubed and taped and IV'd and out cold. i stayed an hour but lost most of it to tests and doctors and residents traipsing in and out. i had just long enough alone with him to sit and hold his hand for awhile, talking to him and telling him how i felt, what i hoped, and that if he really needed to go he could. i gave him a kiss and walked out, swallowing a lump and a chunk of my heart. he rallied last week, but ended up with surgery, complications, and the decision was made yesterday that they're going to pull all life support tomorrow. the tears are salty, and my heart cracked. i know i'm lucky, i know it's life, i know he's lived long and well, i know i know i know. i just don't like. i love my rotten kids, and they're flying out faster than my heart can keep up.